Serve tea in storybook style next time you have a tea party - even if it's just for fanciful grownups! This blue Cinderella pumpkin coach teapot is made of ceramic, produced by Kreisler. It depicts Cinderella cheerfully smiling out the coach's window. For very small girls, here's a pink plastic Cinderella's Coach tea pot. Great for apple juice "tea." Or perhaps your little one prefers Princess Belle, from Beauty and the Beast. Here's Belle's teapot, also in plastic. We suggest using it to serve lemonade! The Mad Hatter Teapot is based on traditional Disney Alice in Wonderland, not the new Tim Burton movie. For a softer, gentler, more pastel Alice, here's an Alice in Wonderland Tea for One set. This Snow White teapot is tinged with peach and decorated with porcelain birds and trees. It's made by Franz, and unfortunately it's for decorative use only (you can't serve tea from it). 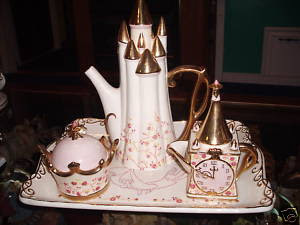 This Disney Cinderella tea set is called "Enchanted Evening." It includes a cookie jar, creamer, teapot, sugar, and serving tray, but unfortunately no matching cups or saucers. You can get a better look at it here in photos from a more expensive listing. "Cinderella and the Prince Dancing" is a figural Disney teapot. Lift the prince to pour out your tea.